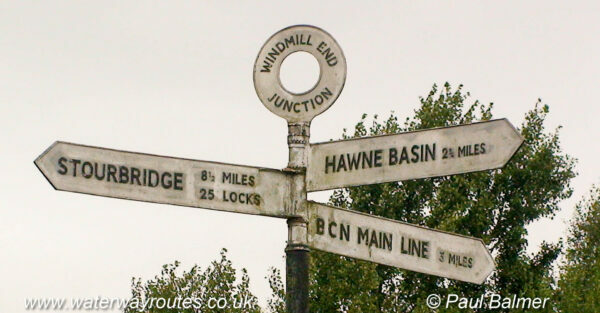 Windmill End Junction lies near the south end of Netherton Tunnel. Despite the sign only having three fingers it is possible to cruise in four different directions, albeit the missing finger would point to a very short branch. The Netherton Tunnel Branch leads through Netherton tunnel to join the Birmingham Canal Navigations (BCN) Main Line at Dudley Port Junction. The Dudley No 2 Canal meets the Dudley No 1 Canal at Parkhead Junction and that leads to Stourbridge. It also leads, in the other direction, to Hawne Basin and the end on junction with the proposed Lapal Canal. The missing finger would point to the Boshboil Branch, now just 130m long, and the remains of what was a much longer loop which once joined to the Bumblehole Branch at the other end.